Surcharge for events in 2020 onwards. Band member providing DJ service outside set times until midnight. The wild energy of their shows has to be seen to be believed and includes members of the band jumping off the drum kit, standing on the double bass and even setting fire to the cymbals! The guys always give 110% to their performances and have the crowd begging for more. The band have gained a huge following from their performances at festivals, clubs, theatres and private events all over the UK and abroad. The guys have also been featured on TV numerous times including Sky1 when they appeared on 'Must Be The Music' with great comments from Dizzee Rascall and Jamie Cullum. Check the video tab above! 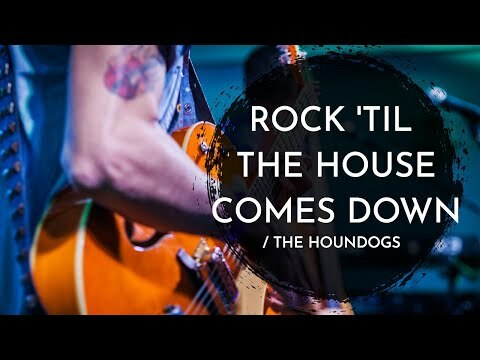 The Houndogs are a popular choice for wedding receptions, birthday parties and corporate events, offering a refreshing change to the more standard function bands. 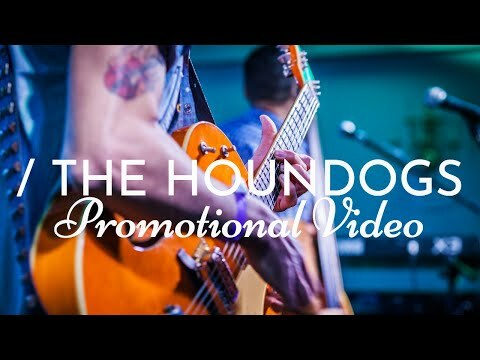 If you want an exciting and memorable event, book The Houndogs! Due to the popularity of this band, it is recommended that you book well in advance to avoid disappointment! The prices in the quote form are correct but please note that there is a surcharge for weddings between May and September (see optional extras). Also, discounts may be offered for special public events and festivals. 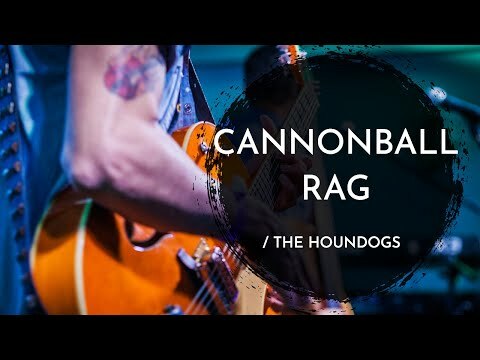 Please note that The Houndogs cannot play through noise limiting equipment, as it just isn't practical to play music like this properly and passionately with such limitations. So, please make sure you choose a venue without a noise limiter installed! Robert plays guitar for The Houndogs, a lively and skilled player who brings audiences alive. His first influence was Scotty Moore, Elvis's guitarist. He now plays a Gretsch Nashville 6120 and loves this instrument especially. Ian plays Bass for The Houndogs, his energy and style make him a vital asset to the band. Ian has been into music from a very young age and his influences include Bill Black (Elvis’ first bass player) and Lee Rocker (the Straycats bass player). David plays drums for The Houndogs, his superb playing adding real impact - especially when he sets fire to his kit! His influences include Joey Jordison (Slipknot), Gene Crooper and Buddy Rich. I would really like to say a massive thankyou to The Houndogs for the spectacular night on Friday 15th February 2019. This is the fourth year running they have played at our fundraising events helping us raise over £10,000. The guys are a great bunch and I would highly recommend them and will definitely be having them again in the years to come. They make our job easy once people are through the door by being themselves and playing great music! It is a sell out every year and this is down to their great talents! On behalf of Holbeach Bank Fc, please can you kindly pass a big thank you to the band for their fantastic performance Saturday night at the Howling Halloween Ball, in Spalding. The feedback has been brilliant, with everyone enjoying the music and entertainment the guys provided during the evening. Thank you once again for a phenomenal performance at Simon’s party on Saturday. I knew it would be good, but you totally blew us away. All our guests were amazed by you and you were the highlight of the night (sorry Simon!). You made the party for Simon and he didn’t want it to end! I am sure we will be seeing you again soon. I think it’s fair to say he made it clear to you he was a fan. Huge thanks for all you did regarding the Houndogs for James and Sophie's wedding. They were absolutely brilliant and the crowd went wild from the outset! I had the pleasure of having supper with them and they are great guys! Thank you also for your understanding and flexibility regarding the date change. Hope to work again with you sometime! Thanks for making our wedding so amazing! You guys really put ona show and everybody loved it! Loved The Houndogs! You have to book these again as their entertainment value was first class but everything about this group was brilliant. Saturday did indeed go very well, thank you. The Houndogs are extremely nice people and amazing performers. How they manage to sustain such a high energy performance is extraordinary, including great tricks - dancing on the bass, playing it upside down, cymbals on fire etc! They really got the crowd going. It was a pleasure to welcome them to Oundle Festival. Just want you to know how much we enjoyed your gig at the Oundle Party at the Wharf Saturday last. Fantastic! As someone who's about to visit Graceland (Memphis) I particularly enjoyed the Elvis numbers... Thanks again it's a joy to listen to and watch you - really entertaining. We just wanted to say a huge thank you to the band for making our night so special on the 08 April 2017. The whole show from start to finish was fantastic. It just made our whole wedding, our guests and us were blown away by their professionalism and performance. Everyone will remember our wedding because of you. Nothing more we can say but thank you once again. I just wanted to say a massive thank you for providing the entertainment at our charity ball on Saturday 11th March. You were brilliant to watch and really made the night a success, we have had so much positive feedback and hopefully this will reflect in your downloads and bookings in the near future. Our guests were blown away by you. We raised £4609 on the night which is just fantastic and so much more than we had hoped for. Just wanted to drop you a quick note to say thank you very much for the amazing performance on Friday night. I know it was a little slow starting, but the feedback for the band and disco has been fantastic and everyone had a brilliant evening. I am a big Houndogs fan, and now many of my colleagues are as well so I hope that we will see you again in the future! Best ever group I have ever seen at Sywell , you should have played in hanger 1 at the night time which would have made our weekend. Keep up the good work, you are all great artist . Just wondered if you could pass on our thanks to the Houndogs for their incredible set at our wedding on 3rd September. All of the guests, young and old, were really blown away by how good they were - even a few weeks later people keep talking about them. They are fantastic at what they do - the performance was so tight and the energy and showmanship were incredible. They were also very professional, friendly and a pleasure to deal with on the night. Overall a real highlight of our wedding. Thank you so much! Hi David, on behalf of the festival I would like to say that the guys were superb, and an absolute pleasure and fun to work with. They have so much energy and are excellent musicians. The crowd loved them! Please pass on our thanks and look forward to working with you, and the guys again in the future. I just wanted to pass on our thanks to the Wilson boys for their great set and support. They were a pleasure to have with us and the small crowd really appreciated their performance. You guys are absolutely amazing!! I saw you perform at Brixworth last weekend and was blown away! What a fantastic and unexpected treat. Would love to see you perform again soon and will try to bring friends along too. Well done & keep rockin. We just wanted to say a massive thank you for playing at our wedding last Saturday 25th June, at the Haycock Hotel, Wansford. You were incredible!! Amazing musicians and fantastic performers! Everyone was blown away by you! And several people came up to us and said that you were the best band they had ever seen!! A few have even said they are planning to come and see you when you play in Romford, Essex! Your energy just had everyone buzzing! Thank you so much! We personally can't wait to see you play again soon!!! I just wanted to ask if you could pass on my sincerest thanks to Robert, Ian and David. My wife's surprise party was an immense success and The Houndogs made it all the more memorable. They were a real hit on the night and nothing was too much trouble for them. I hope that The Houndogs enjoyed playing on Saturday!! They were the highlight of my bash!! I had great feedback from my guests !! Thank you so much for playing at our wedding and making it so very special. People haven’t stopped talking about The Houndogs… you should definitely use them again, I will be if I can ever find another suitable event. Their energy when they are on stage is insane… they nearly spent as much time on the dance floor playing their instruments there as they did up on stage. 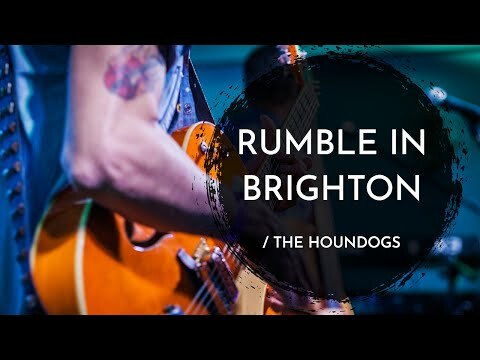 The Houndogs were incredible! Everyone's been talking about them since the wedding - they really enjoyed it. Thank you for performing at our wedding reception - you were awesome! Our guests loved your skilful and energetic show which had everyone dancing. Thank you for helping to make our wedding so much fun. We saw you play at the NSRA show on Saturday night and we thoroughly enjoyed watching and listening to you. Great band, great music, great entertainment. Absolutely fantastic! We all had a fabulous time with The Houndogs in our barn on the 4th July. Three nicer young men would be hard to find and they were loved by all in the village. They are amazing! Just wanted to send a quick note to say a massive thank you for Saturday, we have received lots of comments and thank you cards saying the band were superb. Hope they got back ok and had a lie in on Sunday!! Absolutely fantastic!! Everybody loved them. Had so many comments on them on the night and yesterday. Loads of people asking where I found them and a couple of people wanting to book them for events they organise including one in Belgium. Had people saying they didn't know whether to get up and dance or just sit and watch as they didn't want to miss anything. One guy in particular who usually hates bands absolutely loved them. Head was going, toe was tapping! He said he would pay to go and see them. They were the icing on the cake for a fantastic day. Please can you send my regards and thanks to the hound dogs for saturday night they put on a great show! Everyone had a fab time! You guys were EPIC at our wedding on Saturday! Everyone was up and dancing like crazy people and they haven't stopped talking about how good you were since. THANK YOU!!!!! Just to say thanks for playing at our party on the 6th Sept.
What can I say? Absolutely brilliant - as always! Thanks for rockin' our wedding reception. You were brilliant and everyone loved it! I saw you guys at the lazenby festival and thought you were outstanding truly one of the best live acts I've seen. This is Mike one of the organisers of the Lazonbylive event in Cumbria at which we booked the Houndogs to play for us.. I would really like for you, to pass on to them what a superb show they gave us, without doubt the most talked about and popular act of the day, lovely guys too and very enthusiastic after a long journey north.. I really hope the guys pick up some gigs up here on the strength of their show for us… Many thanks to you and them…. cheers Mike. Enjoyed your gig at the Chelsea Flower Show very much. It was our first visit to the show, and your gig was the best part of it! Just wanted to drop you a note to say thank you to the Houndogs for performing to us on Sunday 28th. They were amazing everyone enjoyed them even though they had to perform on the patio they definitely pulled it off! What a great band! Looking forward to welcoming them back here in July. Hoping the sunshines on us! Fingers crossed. Just a quick note to ask you to pass on our very real thanks to the boys for a brilliant show on Saturday night, they were a very important part of a fantastic day. We have had so many comments from guests about how much they enjoyed the evening,and what exciting and entertaining show the boys provided, as well as being great musicians!! Our photographer commented that he has done hundreds of weddings and they were the best band he had seen at any of them. Laura and Jim have asked us to pass on their thanks too. Kind regards, Robin and Gill Barr. I just wanted to send an e-mail to say how thrilled we were to have them play at the wedding, they got set up very quickly given the timings and had everyone up dancing from the minute they started playing. We're so pleased that they agreed to go ahead with the booking after having to change our wedding date, they really made the evening. Please pass on our thanks to the band. Just wanted to say that the guys were absolutely amazing last night. They were so patient as we ran quite a bit over. Everyone loved them. Thank you for your great performance at Mum's Birthday Party on Saturday. You really were terrific and really made our night! David, Thanks so much for your help sorting the boys for our event on Sat 8th Sept. Everyone had a fantastic time, they were brilliant so thank you. We are already getting asked when they are coming back! wedding in August. You guys were absolutely fantastic! Loads of our guests said how brilliant you were and what a great atmosphere you created. We loved every minute of it so thank you for providing top-class music and entertainment, and for making our wedding such a memorable occasion. Hi, thank you, thank you, thank you! You played at our wedding at Hargate Hall, Buxton, on the 1st September. You made our wedding rock! We have had so many compliments about your band and thought it only fair to make sure you knew how well you went down with everybody. You got family and friends dancing all night long and they loved it! Completely original and and extremely entertaining, wouldn't hesitate to recommend you to people for future events. Guys, thank you all so much for Saturday! You we absolutely outstanding! Everyone at the wedding love you, and we are delighted you played for us! Thank you so much. More than that, you are such lovely people..........Mum and Dad must be so proud of you all - such a lovely family and a credit to them! Thank you so much for making our party such a success.......I know a couple of the guests have since visited your website to purchase CD's and another of Aarons friends (our Son) is hoping to come and see you again at a gig in Nottingham later this year. I wish you all, all the success possible with regards to your future plans and hope to see you all again at some point. In the meantime........keep rockin! We just had to send our thanks for making our wedding night one we and our guests will always remember. We still have guests ringing to say how amazing you were. Hugest thank you. A very big thank you from my family and I. your performance at Greetham Valley on Saturday 14th was outstanding, it really made the night! We have had so much positive feedback from the guests who attended. thanks again! You were absolutely brilliant and we thoroughly enjoyed the music and the performance!! Well done, you made our night!! Just a note to say how fantastic The Houndogs were on Friday night for Paul's Surprise 50th Birthday Party. They were amazing and all our guests were simply gob smacked. Kilworth House Hotel even wanted their details as word got around how brilliant they were. So again many thanks for making our evening a special one and we will be following The Houndogs again when they play at a venue near to us soon. David, just wanted to say the Houndog boys were great – we had so many fab comments from guests. David, I wanted to take this opportunity to thank you and the houndogs for a fantastic performance at our wedding. I cannot tell you how much we and our guests enjoyed the band, the lads were really friendly and put on an awesome show. We have had no end of texts and comments praising the band whilst we have been away. One guest who really likes his music stated that they are the best band he has ever seen! I also really like my music and I think he might be right! I just wanted to email to say a massive thank you to Jill and the band for making my party so amazing on Saturday. They were absolutely fantastic and were a real hit with everyone at the party. I think they will most definitely be getting some more bookings as a result. Thanks again. We just wanted to let you know how much we enjoyed you at our wedding - you were awesome! Our guests are still telling us how much they enjoyed your band. Many many thanks for making our wedding absolutely amazing!!!!!!!! Already one mate has asked for your details for his dad's 70th, so I'll pass them on. Truely awesome! Absolutely outstanding ! You guys have to be one of the best bands I've ever seen live (and I've seen a few). The level of entertainment thrown in to your set was brilliant; a tight, well thought-out set and the showmanship was superb. Just to say how great the band was last night! Enjoyed by all! A huge thank you for playing at our wedding! As always you performed fantastically and got everyone dancing. The choice of songs you played was great and very accommodating, and I loved it when you got the crowd/my sisters involved. We had a perfect wedding and I can honestly say that you contributed to that. Hey Guys, thank you so much for putting on a such show for us on Saturday afternoon. We had fantastic feed back from people attending. OMG!! thanks for making our saturday night THE BEST ever. As a rock n roll rockabilly group you guys are without doubt the best live act i have ever seen.......totally amazing ...fact!!!!! Hi David, have just returned from overseas so sorry this is a little later than planned but I would appreciate it if you could please pass on our sincere thanks to the guys in the Houndogs for the performance they put on at my party. They were really great and totally made the event - everyone loved them so please do pass on our thanks. David, Just a quick email to thank you and the band for last night... It was a great night and everyone was very complementary regarding the effort, professionalism and musicianship of the three guys. Hi, just had to write and say thank you for performing at my 50th Birthday Party. You were fantastic, made the night, everyone loved you. Will definitely be seeing you again. You made both my parties and have been a talking point ever since. Loads of energy. Great tune. Loved it! You had it there man...It was bangin! Just wanted to email to say a massive thanks to the boys for a brilliant night at Tim's 30th party - everyone enjoyed themselves immensely. Tim and I can't get the music out of our head - we just want to relive it all again. Can't wait to see them the next time. The Houndogs were as fabulous as ever, everyone really enjoyed them and I have had lots of positive comments. Just a note to say... Thank you for a top class performance on Saturday night. It was a fantastic night made all the more special by your amazing music. Many thanks. I know that the size of the audience was a little smaller than the Houndogs might have been used to last night but their performance was outstanding. Everyone is wallking around the College, happy, smiling and saying what a good time they had. The energy of the band is incredibly infectious. They are absolutely fantastic! Just wanted to say a big thank-you... Mickey and I had a wonderful time thanks to you all. With best wishes and thanks once again. Hi David, I just wanted to drop you a line to say thanks again to The Houndogs for putting on such a great show for Penny's party on Saturday. They guys really made the night go with a bang and had everybody up dancing. They were fantastic! Justed wanted to say a huge thanks to the Houndogs for their performance at our wedding on 30th August 2009. They were absolutely fantastic - which we knew they would be - but people who came to the reception who had not seen them before were amazed. People are still talking about it to us! Just a quick not to say what a great show at Penny's Birthday, and great fun!! Especially the free form solo in Blue Moon of Kentucky ;0) - I may have cracked it in another 10 years! Catch you again soon. Hi Lads, I would just like to congratulate you on a brilliant set yesterday at Paul and Jean’s wedding. I have been to see hundreds of groups over 40 years and you are up there with the best. Please could you pass our thanks on to the Houndogs for the excellent job they did for us yesterday. Everyone enjoyed the show very much and were very complementary of the band. We were at The Fox & Hounds @ North Luffenham on Friday night and The Houndogs were amazing - they just keep getting better. Look forward to hearing the boys again at Edith Weston and would like to wish them the best of luck for the GMTV competition - if there's any justice they'll win it hands down! I just wanted to drop you all a line to say a huge THANK YOU for playing at our wedding at Blake Hall in Ongar, Essex, on July 26th. It is fair to say that you ‘made’ the wedding – we have had hundreds of compliments (on your behalf!) and lots of queries that I hope might result in some extra bookings for you guys. We were really looking for something different – and it wouldn’t have been as perfect as it was without you. Just wanted to say what a fantastic time we had at ours sons wedding on 26 July 2009 at Blake Hall in Essex. We thought you were amazing. It was the most beautiful fun wedding I've ever been to and I think your band had a lot to do with that. Thanks again. To the Wilson Brothers, Just wanted to drop you a note to say how nice it was to meet you all at our Centre's Conference a couple of weeks ago. I also thought that you did a fantastic job! Dear Robert, Ian and David, I am writing to thank you for the wonderful performance you gave at my daughter’s wedding on 6th June at The Bell Inn Stilton. We had a fantastic day and the entertainment you provided really was 'the icing on the cake'. You clearly are born entertainers and won the whole crowd over from the first song. Four weeks later I still have people commenting on your performance. I understand you have already picked up at least one booking from the audience that night, and we will certainly not hesitate recommending you to everyone we know. In fact we are already looking for an excuse to have another party just so we can enjoy another evening being entertained by you. Once again many thanks and good luck for the future. Please pass on my very sincere thanks to the Wilson brothers who played at our party at the Danish Invader on 8 May. The group, as ever, were professional, and capitavated our guests with the most entertaining evening. Their talent is unique as everyone from 8 to 80 really enjoyed the spectacle they created. A year ago, when I first saw the Hound Dogs, I was totally amazed by them and they certainly did not disappoint me this time. Thank you all so very much, you provided the best birthday present possible. I just wanted to say what a great show you guys did last night. I attended the evening do at the PPC show along with the editorial members of the mag and saw you sound check and perform. You were brilliant and I really enjoyed watching you. I get to see lots of local bands but I haven't seen one as musically and visually good as you for a very long time. Hopefully I'll catch you again soon. I live in Peterborough and you've got quite a few gigs lined up around the area over the next few months. Well done and thanks again for a great night. Hi David, I just wanted to pass on our thanks to the Houndogs for providing such an entertaining evening for us on Saturday. They played for us at our fundraising event last year and many people returned to see them again this year and those that saw them for the first time on Saturday were impressed. My husband, Gary would like to say a big thanks as he joined in on the drums for “Stray Cat Strut” and he’s still going on about it now. Please could you pass on a massive thank you from Brigstock School PFA and I’m sure we’ll be in touch for another booking in the future. The Houndogs really were excellent! Just wanted to drop you a quick line to say that i had the greatest night of my life at my party on the 10th Jan @ the football club!! the boys were soooooo fantastic, please pass on how grateful I am to them for making my night so special. Thank you! I just wanted to let you know that we had a fantastic evening on Saturday with the Houndogs and the village is still buzzing! Every organisation within the Brigstock now wants to book them for their event so I'm sure we'll be in touch very soon to check their availability! Please pass on a huge thankyou to the boys - they made our fundraising event more successful than we could have imagined. Hospitality/Artist Rider: Hot meals for 4 people prior to performance and soft drinks as required for the duration of the visit. Technical Requirement: 2 x 13 amp sockets near to the stage area.